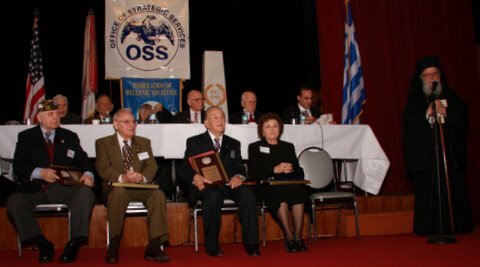 "OSS and Greek Government Honor Greek OG's and SI in New York, May 18th, 2008." 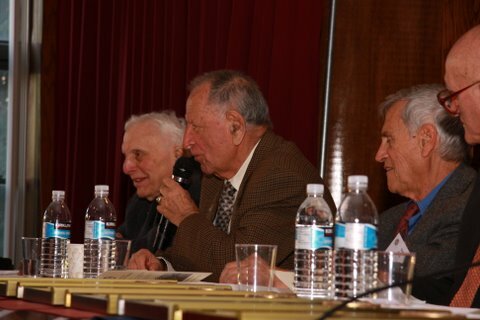 From left: Helias Doundoulakis, Gus Vellios, and John Giannaris. Giannaris, supported by Greek partisans, disrupted the Salonica-Athens rail line and inflicted major damage to German troop convoys. 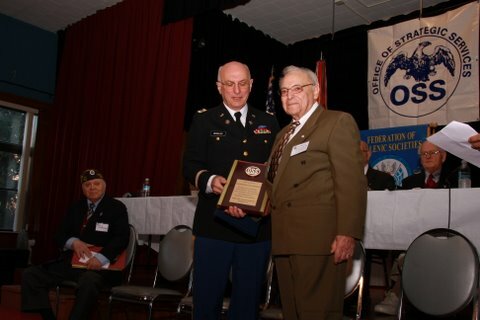 In September of 1944, Lt. Giannaris was severely wounded when he stepped on a landmine trying to rescue another OG. 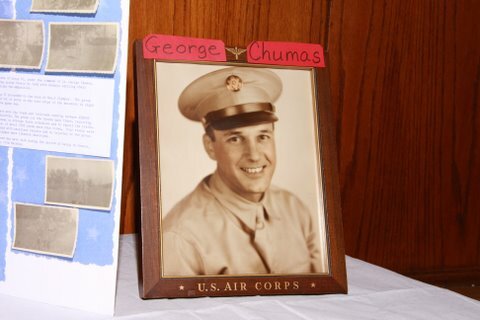 He and the Greek OG's received the Bronze Star sixty years later for their service. John has written a book on his war experience, called "Yannis". see http://www.feldgrau.net/forum/viewtopic.php? 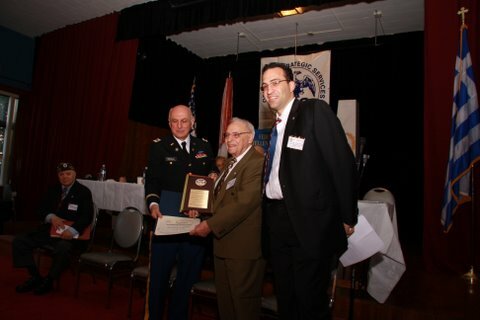 l to r: John Giannaris, OSS OG Group 2; Greek General Consul Aghi Balta; Congresswoman Maloney; Col. Leontaris of Greece. l to r: Gus Vellios, OSS OG group 5; Greek General Consul Aghi Balta; Congresswoman Maloney, Col. Leontaris of Greece. Gus Vellios disrupted rail lines around the Yiannitsa area, and destroyed German communications northwest of Salonica. He was wounded in action. 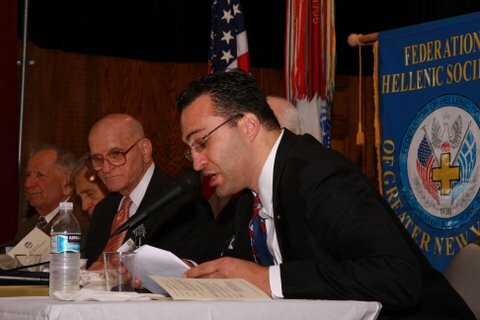 l to r: Helias Doundoulakis, OSS SI; Aghi Balta, General Consul of Greece to New York; US Congresswoman Carolyn Maloney of New York's 14th District; Colonel Ilias Leontaris, Defense Attache, Greek Embassy. Group photo of OG's, author, and relatives of deceased OG's. From left: Rita, Plato, and Helias Doundoulakis. 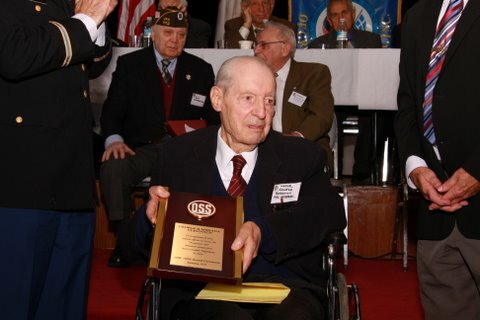 "November 22nd, 2008, OSS Society Honors Italian-American, Yugoslavian-American, and Greek-American OG's and SI in the Mediterranean Theatre." Sgt. George J. Doundoulakis, Greek SI, Volos. From left: Rose Eve Doundoulakis-Dehazya; Chris Doundoulakis. 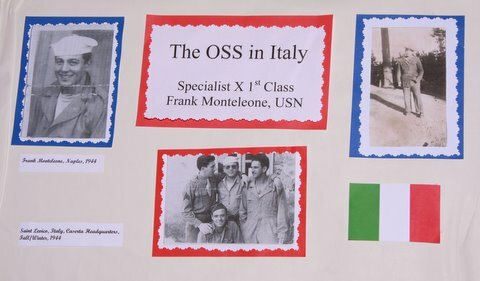 Frank Monteleone, on left, with Salvatore Gagliardo, both OSS in Italy. 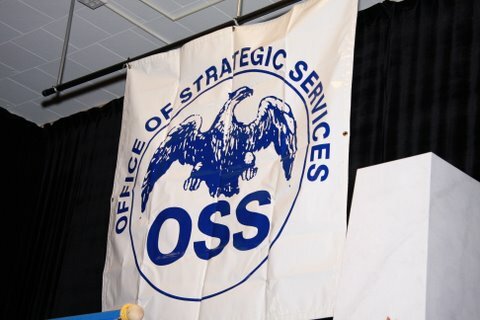 OSS Italy. Frank Monteleone, Moe Berg's radio operator. Frank Monteleone, OSS, radio operator for OSS spy Moe Berg, with Salvatore Gagliardo, also OSS Italy. 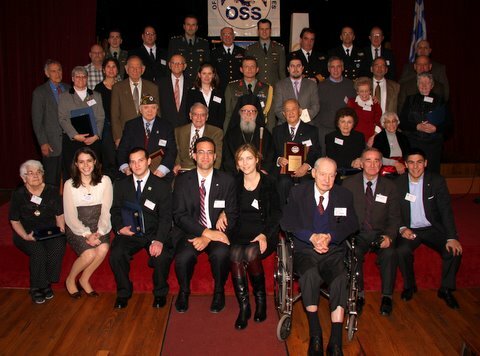 First row, r to l: Col. Neroulias, US Army, veteran of Vietnam and the CIA; Col. Leontaris, Greek Defense Attache; Sophie Veve, Greek Consul of New York; Andreas Panayiotou, Consul-General of the Republic of Cyprus; Kalamaras Demetrius, President of the Federation of Hellenic Societies; His Eminence Archbishop Demetrios, Primate of the Greek Orthodox Church in America. 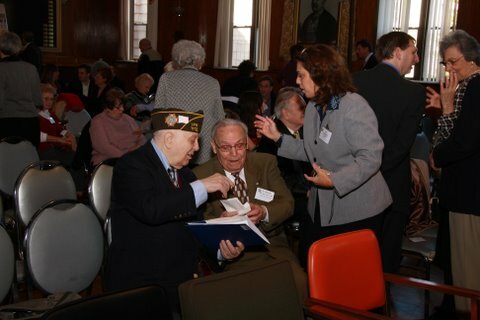 l to r: Steve Statharos, Esq., OSS Society, Frank Monteleone; Col. Neroulias. Frank went on a mission with famous OSS Spy, Moe Berg, into German Occupied Rome to recover documents of an Italian nuclear physicist related to atom bomb research, for the Manhattan Project. see http://en.wikipedia.org/wiki/Mo_Berg. 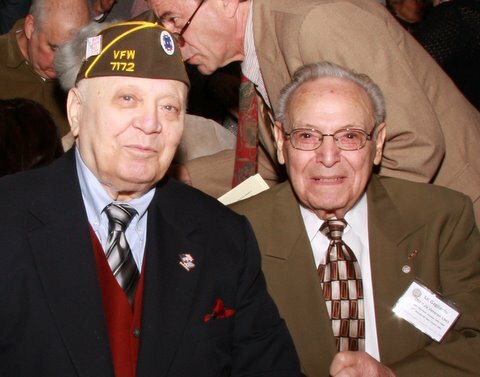 Col. Neroulias and Salvatore Gagliardo. Now 93, Sal participated in crossing German lines in Italy to communicate with and supply Italian Partisans with weapons and ammunition. Before OSS, Sal scaled the cliffs of Mt. Belevedere in Italy to attack German forces from the rear in an epic and famous battle that has gone down in history as an incredible military achievement.An alumnus of Stuyvesant High School '35, he worked in the Art Department at the 1939 Worlds Fair and worked for the city of New York for over 50 years as an engineer and community board member (still active), and lives in Astoria, Queens. 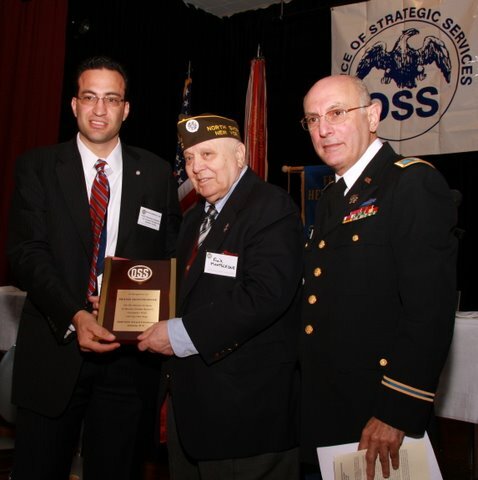 l to r: Col. Neroulias, Sal Gagliardo, and Steve Statharos, Esq., OSS Society. 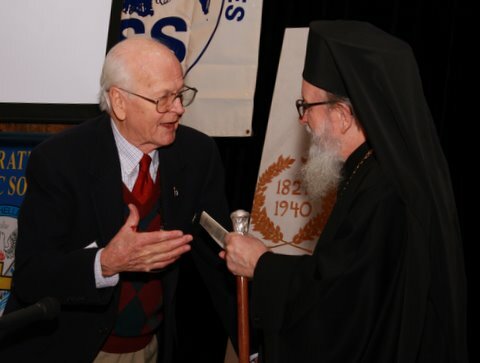 Dr. Robert Perdue, historian and veteran of the 101st Airborne, has authored a book on the Greek OG's, here with Archbishop Demetrios, Primate of the Greek Orthodox Church in America. 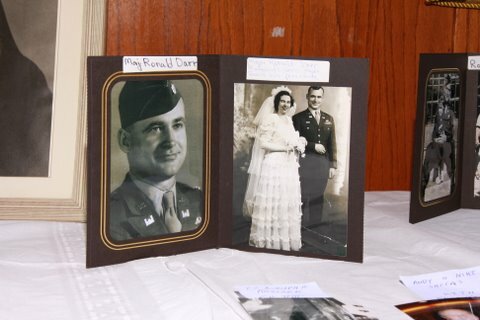 Robert Perdue was with the 506th Parachute Infantry Regiment of the 101st Airborne Division, and his book is titled:"Behind the Lines in Greece: The Untold Story of OSS Operational Group II", which was published in 2010. 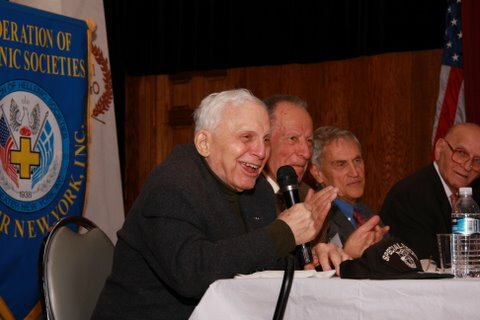 George Vojnovich, age 93, orchestrated the rescue of 500 Allied airmen from German-Occupied Yugoslavia in what has become the largest military airlift of stranded personnel from behind enemy lines in history. Using DC-3's which require 700 yards of runway, they landed dozens of planes on a 710 yard runway carved out of a mountaintop. He is the subject of the recent book "The Forgotten 500". 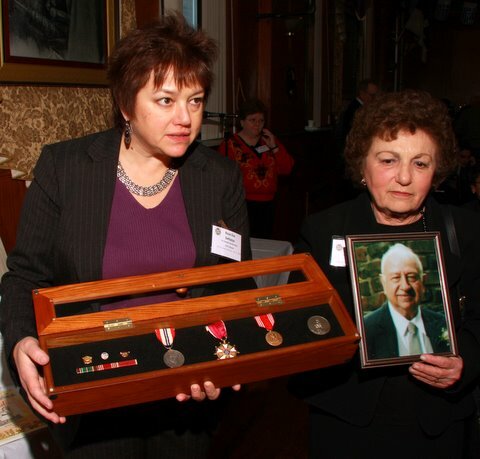 l to r: Col. Leontaris, Helias Doundoulakis, Col. Neroulias. An OSS SI spy in Salonica, or Thessaloniki, Greece, Doundoulakis was responsible for sending 400 radio messages while dodging the Gestapo. One of his messages led to an airstrike on the railroad station in Thessaloniki which led to the killing of 2,500 German soldiers. Mr. Doundoulakis was an engineer in the US Space program and created the landing gear for the 1969 Apollo moon landing. 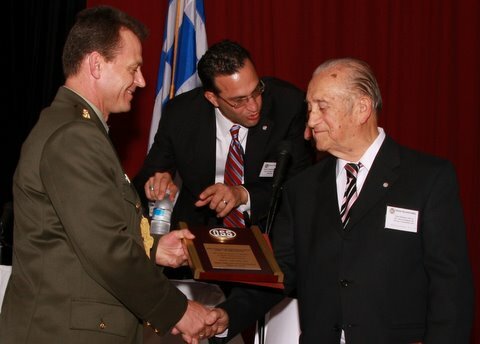 l to r: Col. Leontaris, Steve Statharos, and Helias Doundoulakis. 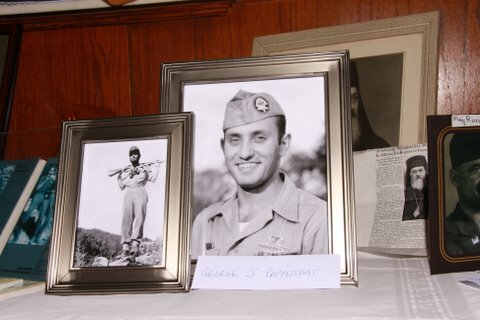 Foreground, l to r: Frank Monteleone, Sal Gagliardo, Helias Doundoulakis, and Chris Doundoulakis, widow of George Doundoulakis, OSS SI, who organized and led 6500 guerillas on Mount Pilion, Greece. Greek OG's seated above. 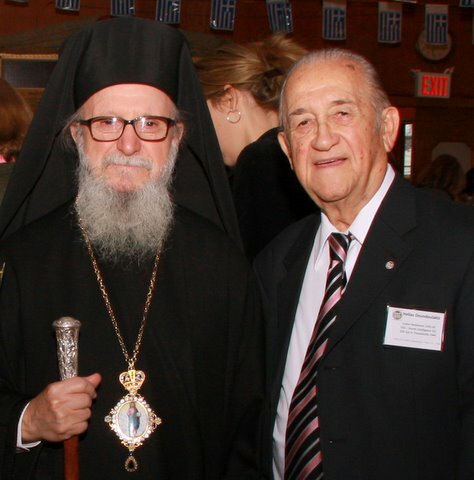 His Eminence Archbishop Demetrios is on right. l to r: Archbishop Demetrios, Sophie Veve, Col. Leontaris, Laura and Steve Statharos. Steve Statharos of the OSS Society introducing Greek OG's. John Giannaris, OG Group 2, Gus Vellios OG Group 5, Gust Babalis OG Group 7, and Gust Kraras, Group 1. Group photo of OG's and SI with family members of deceased OG's.